Simpsons Trivia is a Sega Master System homebrew game by SteveProXNA. The Simpsons is a hit TV show that has become a world wide phenomenon. 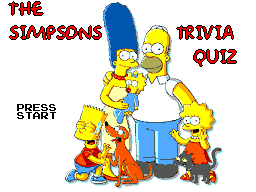 Therefore, it seems only natural to build a Simpsons Trivia game for the Sega Master System!